Chips and dip. Biscuits and tea. Salt and pepper. All super-fantastic pairings that we can enjoy everyday without blowing all of our hard earned pennies. Sometimes, however, we get a chance to try some pairings that are far beyond the “day to day”. You know, the really indulgent stuff. Champagne and caviare for example. Whisky and…well that’s the thing. Whisky has been matched with so many things in recent years it’s hard to say what it goes best with. Cigars. Whisky and Cigars. Even just saying it aloud feels right. Yes whisky has had it’s dalliances on the side with certain cheeses and a large number of chocolates. I’ve really loved every tasting I have been to where I’ve matched whisky to cheese and chocolate. I also appreciate the way that these matches make whisky a little bit more approachable to people that might otherwise be a little intimidated/uninterested in it. For me though it always comes back to the pairing with cigars. 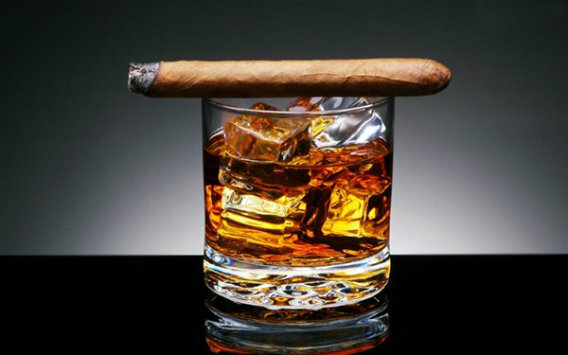 Those that know me will know that I am not the biggest cigar smoker around but I have certainly enjoyed the few occasions where I have had the pleasure of a great whisky and a great cigar at the same time. Such as when I visted Gleneagles Hotel with Tiger. That feeling when you sit down with a whisky in one hand and a cigar in the other is something truly special. You could be in the dullest, lowest paid job the world has to offer but with those two magical ingredients you can feel like a millionaire. Just for a moment. And it is those moments that have to be savored. That’s why when the wonderful Graham Rushworth from Whyte and Mackay invited my work colleagues and I for a night of sampling some of the whiskies from the Dalmore range and matching them with amazing cigars I was never going to say no. Cigar smoking has become a difficult thing to do here in Scotland ever since the smoking ban was brought in so our choice of venue was the gorgeous Hotel du Vin just off Bristo Square in the heart of the city. Why? Well because of their cigar bothy of course! 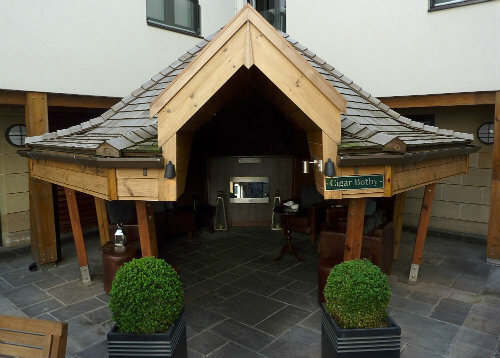 An outdoor heated area created for the comfortable enjoyment of cigars even in the wild weather conditions of Scotland. Altogether we matched five whiskies with five cigars. Dalmore have been working closely with Hunters and Frankau, the UK’s only Cuban cigar importer, to match several whiskies in their range with specific cigars. I’ll list the exact matching at the end but right now I’d like to talk about the star of the show. 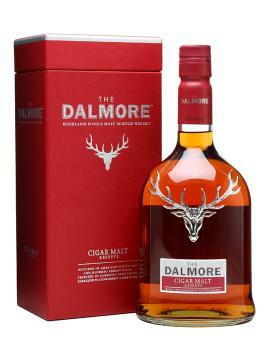 The whisky that was engineered to be enjoyed along with a cigar- the new Dalmore Cigar Malt. Nose: Cinnamon, ginger and crumbling Autumn leaves are what appears to me initially. Notes of the bitterest styles of dark chocolate come through with a light feeling of coffee beans. It is all wrapped in a toffee sweetness. Palate: Toffee and orange zest. A dry wood note is there in the middle. Altogether it is full, rich but never feels too heavy. Finish: Light, fresh and a sweet spice lingers just long enough. 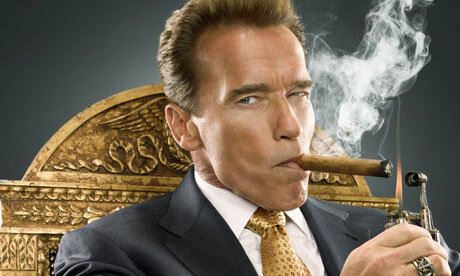 With the cigar: Without a doubt this is where it comes into it’s own. The whisky becomes so much lighter and sweeter. The flavours from the red wine casks come to the forefront- all those red berry and fruity flavours. Lovely! I know that not everyone enjoys cigars but then not everyone enjoys whisky. For the people that enjoy both these things this is one that I highly recommend trying. Also, if you can, do it at Hotel du Vin. It’s lovely there. A big thanks to Graham for the evening. It’ll be a good while until I can try something like that again. This entry was posted	on Wednesday, August 22nd, 2012 at 7:04 pm	and is filed under Reviews. You can follow any responses to this entry through the RSS 2.0 feed. Responses are currently closed, but you can trackback from your own site.